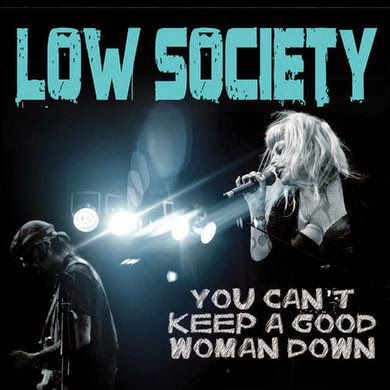 I just received the newest release, You Can't Keep A Good Woman Down, from Low Society and it has edge. Opening with Blues Rocker Crammed & Jammed, vocalist Mandy Lemons is riding high on the slide work of Sturgis Nikides, supported by Mike Munn on drums and Nick Dodson on bass. Voodoo Woman again features the master slide work of Nikides with a style not a lot dissimilar to Rod Price. Lemons has the ferociousness of Pearl but her own style. Rick Steff adds a cool organ line and Dr. Herman Green some cool sax. Need Yer Love has an unusual euro sounding construction making it really stand out. With it's calliope feel and Nikides on slide, Lemons lays down some of her bluesiest vocals. Son House Says has a smooth jazzy feel but almost like a twist on "Sumertime". Keywork from Steff helps the shape the track but this is really all about Lemons. A funky twist midway led by Dodson and Muss adds texture and Nikides slides in with a cool solo as well. Title track, You Can't Keep A Good Woman Down, has a very cool boogie rhythm led by a solid bass line from Dodson. Nikides takes a slick ride on the slide on this track making it one that is most likely to end up on the radio. Very cool! Possibly my favorite track on the release, This Heart Of Mine is a slow ballad with heavy blues overtones. Building intensity throughout the track, Nikides and Lemons really hit it on the head. Excellent! Up In Your Grave has a country gospel feel with a bit of pickin and a two step rhythm. Let Me Ride has a deep south spiritual feel with Lemons coming on strong. Slide work from Nikides and light piano work from John Shaw gives it a bluesy feel. No Money Down is a ballad with a western feel. Perfect rhythm from Munn on drums makes this effect particularly clear along with steel work from Nikides. You Got A Right is a rolling blues track with an easy R&B feel (Think I'm Tore Down). Nice guitar work from Nikides adds to the rolling momentum overall. El Diablo is a fairly contemporary ballad featuring the lead vocal of Lemons but with a cool acoustic guitar riff from Nikides. Wrapping the release is Should've Known Better, a solid Texas style blues track. A solid sax solo from Dr. Green and a few cool riffs from Nikides top it off.